So I Read on the Internet that Steampunk is going to be even more popular in 2013. If true, that’s sort of impressive. This retro-futuristic style-and-culture trend has been gaining steam (har har) since the late 1980s, when the name was coined. (The trend existed before that, of course, but – as with Parkour – agreeing on what to call something can really help a community to form around it.) I’m a bit surprised that this fairly goth-geeky style hasn’t blown over in two-plus decades…surprised but very pleased, as I’m a big fan of Steampunk myself. So if it’s only getting bigger…well, count me in! Grab your goggles and let’s rock and roll! 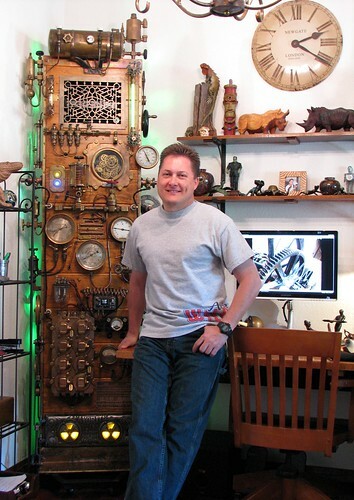 Admittedly, it seems a little bit silly to start blogging about Steampunk now. If you’re just hearing about it now, Dear Reader – well, welcome to the party! I’ll try to bring you up to speed with this post – but after all, Wikipedia explains the aesthetic and its history pretty clearly, and if you’re a fan already I probably can’t show you many links you haven’t already seen on other blogs. But if this blog is about any one thing, it’s about making cool-looking stuff out of old junk…so, Hello Steampunk! A Brief History of the Future of the Past. Steampunk began as a literary subgenre. Essentially, it’s alternate-history science fiction, stories that take place in a world where advanced technology continued to use steam power, brass gears, varnished wood and decorative scrollwork – rather than the transistors-and-plastic future that really happened when the industrial revolution switched to electricity in the 20th century. Jules Verne and H.G. Wells wrote some of the earliest still-popular fiction compatible with this vision, often writing science fiction that extrapolated but little from their own contemporary reality. Verne’s Nautilus submarine was plausibly practical (real subs predated his story) but exceedingly potent and luxurious – a sort of underwater Pullman car, and then some. Indeed, it is the tension between rivets and velvet that gives the Steampunk aesthetic much of its allure: the allure of a lost-in-the-timelines world where our ubiquitous machines are still expected to be pretty on the outside, Newtonian and comprehensible (to the mad tinkers, at least) on the inside. Trends often jump from science-fiction literature to film, and the Steampunk look is almost as old as film itself: A Trip To The Moon was based on an H.G. Wells story and began to establish the Steampunk look with its riveted space capsule. Rivets and velvet look good on film, and this aesthetic was revisited periodically in movies, most famously in the 1954 adaptation of 20,000 Leagues Under the Sea and 1960’s The Time Machine. The modern Steampunk movement grew from these roots. The word comes from the science fiction community – it’s a play on the term “Cyberpunk”, which refers to a genre of “high tech lowlife” stories exemplified by William Gibson’s novel Neuromancer. The idea of a “steam-tech lowlife” is not uncommon in Steampunk fiction – starting with Captain Nemo, perhaps – but the term encompasses the utopian side as well. Modern authors have explored many variants of the basic “what if”: what if Babbage had finished his brass computer? What if Dungeons and Dragons had robots? And on and on. But Steampunk has never been just about storytelling. It’s really a vision of a texture the world could have had. Thus, the modern Steampunk movement (is it a movement? or simply a trend, or a hobby? whatever.) is predominantly about that texture. It centers, I think, on visual arts, particularly hobbycrafts: costuming, jewelry, kinetic sculpture, and of course computer case mods. Nothing better exemplifies the irreverent-yet-reverent flavor of Steampunk than a computer with steam gauges and gears. I’ve been seeing pictures of cool Steampunk projects online since there was an online. If you’re just catching up, here are a few of my favorite links from the the past of the future of the past. Crabfu, whose steambots really roll. What a hobbyist! Notice he’s even got a steam-powered Radio Shack Armatron! Wild. Of course there’s plenty of Steam-swag for sale online. I thought these watches by Haruo Suekichi really hit the mark. (I mean, I haven’t bought any, but the pictures look great.) That’s just one example among uncountable artisans these days, if your taste runs to buying stuff. Personally, I prefer making things for myself. A watch like that would be great fun to build for yourself from old watches, purses, and whatnot. I don’t know if Datamancer’s first Steampunk Laptop actually began the case mod frenzy, but it’s the first one I heard about and it got a lot of mainstream press attention for Steampunk at the time. Yeah. That. Steampunk is That. Well, gee, I guess there’s not much to say after that one, so I’ll stop there.